These bodysuits are like a second skin, a smooth, funnny skin, a funskin, covering from head to toe. The stretch, elasticated fabric covers feet, hands and head and there is a double zip at the back, which goes right to the top of the head. You can still breathe as normal through the fabric and see through it and if you want to reveal your identity you can just unzip the head part and fold down. Where to wear your lycra bodysuit. ou know these will be great for parties, as a festival costume or charity event. Our funskin suit currently comes in 2 colours, Blue or Black but more colours will come if you like them. There are 4 sizes which should fit most shapes between about 155 cms and 194 cms. Sizing, as with all funzee products, is unisex and best based on height as this determines the overall length. 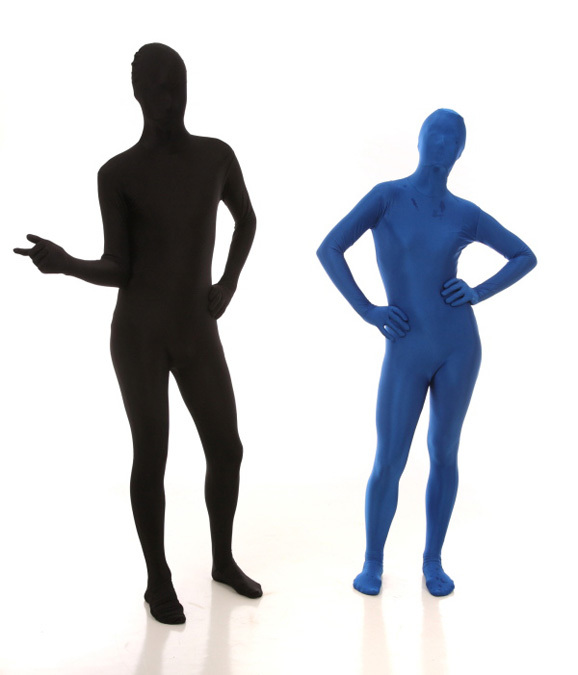 Funskin lycra body suit – Blue or Black – funskin good fun!